Click here to see many online booking capable Victoria BC accommodations. 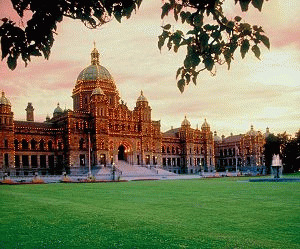 Victoria British Columbia is BC's capital and Victoria and her accommodations live up to the reputation of British charm. Investigate and book Victoria BC accommodations and enjoy Victoria's early beautiful blooms and friendly people. Accommodations in Victoria include beautiful heritage manors, luxurious Victoria Inner Harbour hotels with spas, unique Victoria bed and breakfasts. Alternatively, you can relax in a quiet resorts less than half and hour from downtown Victoria. Victoria BC is known the world over for its temperate climate temperate and glorious profusion of blossoms. The weather has allowed gardening to be not so much a pastime as a competitive sport. In addition, Victoria BC is home to truly Pacific Northwest activities like whale watching and wild life viewing. Booking accommodations in Victoria BC is easy, but don't forget nearby towns like Sooke and Sidney where there are high quality accommodation choices as well. Within walking distance of Victoria's Inner Harbour, this hotel offers comfortable guestrooms with free high-speed internet access as well as an on-site restaurant. The hotel features guestrooms with luxurious Aveda bath products. Guests will also appreciate fresh fruit upon arrival as well as access to the on-site fitness center and relaxing, full-service spa. The Harbour Towers Hotel & Suites offers first class accommodations to business and leisure travellers in downtown Victoria. We feature spacious rooms, generous amenities and sweeping views of Victoria's Inner Harbour. Our One Bedroom, Two Bedroom and Luxury Penthouse Suites include fully equipped kitchens. We are located a short stroll or carriage ride away from downtown Victoria. Situated directly across the street from Mayfair Shopping Mall in Victoria, this hotel is just minutes away from the city centre with easy access to bus transport, shopping and restaurants. The inn is near many local tourist attractions. Guests will enjoy the indoor heated pool and sauna. In the morning, coffee and newspapers are available on the hotel's patio. Our Victoria boutique hotel has expansive ocean, and residential views paired with an unparalleled array of luxury amenities and services. All rooms and suites offer at least one fireplace and large spa-inspired bathrooms in addition to flat screen HD TVs and wireless Internet. Many of our rooms and suites also offer either kitchenettes or full kitchens. Near the Inner Harbour and Beacon Hill Park, this cozy, all-suite hotel in downtown Victoria offers spacious accommodations with comfortable amenities and convenient services. The inn is next to various attractions. The guest suites are completely non-smoking and offer refrigerators and microwaves. Guests have access to in-suite coffeemakers and teakettles. Set on 1.6 acres with landscaped gardens, this Victoria motel is 4 km from Cordova Bay Golf Course. Simple guest rooms at Cherry Tree Inn include cable TV and free Wi-Fi. Cordova Bay Beach is a 5-minute drive away where guests can kayak or swim. Hatley Park National Historic Site and Hatley Castle are 13.8 km away. Sandman Hotel Victoria is one mile from Victoria Inner Harbor. The hotel features a business center, free parking and free Wi-Fi in every room. The rooms include a coffee maker and hairdryer and are equipped with air conditioning and cable TV. Sandman Hotel is 2 miles from the Royal Athletic Park, a sports venue. The Victoria International Airport is within a 25-minute drive of the hotel. Our beautifully restored award-winning heritage building is located in the heart of downtown Victoria BC near the lively Inner Harbour. The hotel offers 29 distinctive one and two-bedroom suites: perfect for business travellers as well as vacationers and families. Many suites feature two-storey lofts and accommodate up to six. Each suite offers a spacious living area and a fully equipped kitchen. Victoria's only 5 Star, full service hotel. The 304 guest rooms & suites have private balconies, air conditioning, & complimentary Internet access. Enjoy casual West Coast Cuisine in The Pacific Restaurant, exclusive private dining in The Mark & specialty coffees, smoothies, baked goods & deli-style food at The Courtyard Café. The Embassy Inn is ideally situated in Victoria's magnificent Inner Harbour, directly adjacent to the Parliament Buildings and in strolling distance of the many tourist attractions, shopping and dining experiences. Serving both discerning leisure and business travellers, The Embassy Inn is Victoria's most affordable Inner Harbour hotel offering comfort, convenience and style at a reasonable price. Overlooking Victoria Harbour, Spinnakers Gastro Brewpub & GuestHouses is located 1.5 km from Victoria city centre. It features rooms with a spa bath and free Wi-Fi, a flat-screen TV and a fireplace. Each has a private patio and a free beer and truffle tasting. A gourmet breakfast is delivered to the room each morning. Our Victoria motel offers a range of comfortable, clean and affordable accommodations. All rooms include free parking, free WIFI, digital TV's, mini fridges and coffee & tea. Suites are available with full kitchens. Free wireless internet access. Complimentary in-room coffee & tea. Digital TV with 70+ channels including sports & movies. Complimentary storage for bicycles. We are located on the scenic Gorge Waterway, only minutes from all of Victoria's major attractions. We pride ourselves on personal service, attention, and recognition and offer an ambiance which the big hotels often lack. Our hotel is pet friendly. We have Standard rooms, Home Office Rooms, Mini-suites, Deluxe Suites and Executive Suites. Group and corporate rates available.